Do you enjoy a good smoothie? Do you love blackberries and grapefruit? If you answered yes to both questions, then you’re going to want to make our Blueberry Grapefruit Smoothie as soon as possible! It may just become your new favorite smoothie recipe - one that you’ll want to share with friends and family on Facebook, Pinterest, Instagram and Twitter. The fabulous combination of ingredients - pomegranate juice, Cabot Lowfat Greek Yogurt, two cups of fresh blackberries, one whole grapefruit (peeled and segmented), pitted and chopped Medjool dates, chia seeds, and fresh mint sprigs - results in two servings of a truly refreshing smoothie. All of these ingredients are simply added to a blender in the order listed and blended until nice and smooth - approximately 3 to 5 minutes. Pour into two tall, clear glasses and garnish with a topping of a few fresh blackberries and a sprinkling of some chia seeds and fresh mint sprigs, if desired. Insert some straws, sip, and enjoy! Want to try another great smoothie recipe? Our Orange Yogurt Smoothie is another smoothie with a citrus flavor, but is even simpler and quicker to make as it only uses three ingredients. As a cooperative of over 800 farm families, Cabot continuously strives to produce the best dairy products that exist. 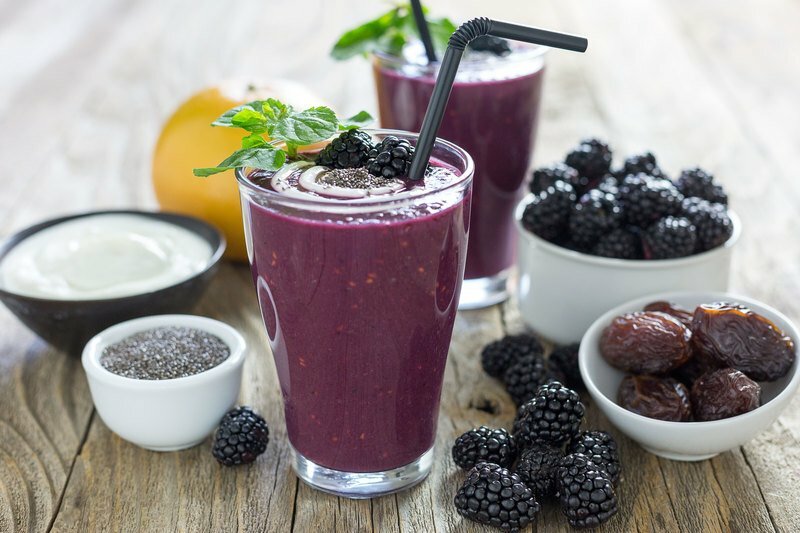 If you enjoy our blackberry grapefruit smoothie as much as we think you will, we’d really appreciate it if you could rate and review it after trying it. ADD all ingredients, except garnish, to a blender in the order listed. Blitz for 3-5 minutes or until smooth. GARNISH by topping with fresh blackberries, a sprinkling of chia seeds, and a sprig of fresh mint. YUM! Love Cabot's Greek Yogurt so much, great for baking with too.